This heavenly Instant Pot peanut butter and caramel cheesecake is almost worth the price of your pressure cooker! It is intensely rich, dense and silky in texture. Read on to get the recipe plus tips on how to achieve cheesecake perfection and avoid common mistakes. It’s fair to say that I have a little crush on my Instant Pot pressure cooker 🙂 But I am not alone in my infatuation, judging but the sheer volume or recipes cropping up online or the number of Facebook fan groups. For the most part I have been making savoury recipes, family dinners such as my Vietnamese beef stew, Italian chicken soup or the lentil and bean chili. This peanut butter and caramel cheesecake is my first sweet pressure cooker recipe and guaranteed not to be the last. Making cheesecake in a pressure cooker is such a game changer – it is so much easier and less fussy than baking in an oven. You don’t have to bother with a water bath, or pre-baking the crust. That’s not to say that making a pressure cooker cheesecake is totally trouble-free. Learn from my mistakes, avoid some common errors and achieve cheesecake perfection ‘under pressure’. Which pan should I use? The first time I made cheesecake in my pressure cooker, I used my 7 inch springform pan. It worked reasonably well, but I had great trouble removing the cheesecake cleanly. I was more than a little gutted, if I am honest, as my first cheesecake was otherwise perfect. I invested in a 7 inch deep loose base pan for my later efforts and was relieved to be rewarded with an easy to remove cheesecake with a perfectly crisp crust. The closest tin to Fat Daddio’s cheesecake pan – recommended by almost everyone in North America – was Alan Silverwood anodised 7″/18cm cake pan* and I couldn’t recommend it more highly. My second pressure cooker cheesecake cake out of the cake tin in one piece, but it puffed up in my Instant Pot like a soufflé and the top stuck to the foil I had covered the tin with. This is basically a sign that I had beaten the ingredients a little too energetically, introducing air into the filling which then expanded during the cooking. To achieve a texture that’s dense and yet silkily creamy, the ingredients have to all be at room temperature first and beaten just enough to combine. I used a hand mixer for this but if you only have a stand mixer then use the paddle attachment. Some prefer to cook their cheesecakes uncovered which takes less time. I found that with this method, condensation collects on the surface which I wasn’t too happy with. So I opted to cover my cheesecake with foil and to also line the base with kitchen towel and foil. How long to cook for? In terms of cooking times, pressure cooker cheesecake recipes vary quite a lot. I found that this cheesecake needed 50 minutes cooking at high pressure and a 10 minute natural release. When the cheesecake is lifted out of the pressure cooker it should still have a little ‘jiggle’ in the centre. If the cheesecake is too jiggly, then it hasn’t cooked for long enough. Cook for a further 5 minutes and allow for a further 10 minutes natural release before taking out again. The cheesecake needs to cool completely at room temperature first – make sure you remove all the foil – and then chilled in the fridge overnight. The cheesecake needs a few hours to set and achieve the perfect texture. Anyone fancy garlic-scented cheesecake? I didn’t think so! Your pressure cooker’s silicone ring can hold on to strong odours from savoury recipes and then lace your sweet ones with unwelcome faint smells. This is easily avoidable – simply invest in a separate silicone ring* for sweet recipes, they even come colour-coded for this purpose. Make sure to pick the right size for your pressure cooker. 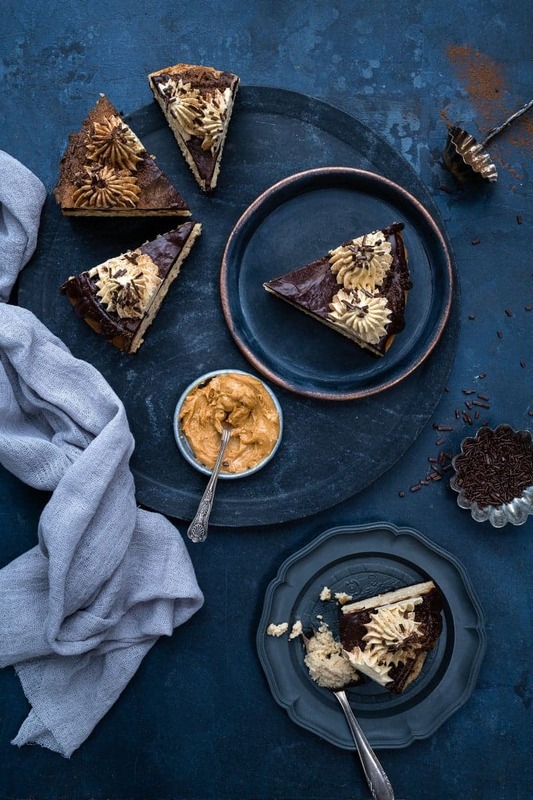 To get back to the peanut butter and caramel cheesecake – “finally!” I hear you sigh – this is insanely delicious and equally rich. I would say that a smallish cheesecake could easily serve 8-10 people provided the slices are not too generous. Once the cheesecake is cooked, the top is smothered in dark chocolate ganache and topped with caramel whipped cream. You could add mini Reece’s peanut butter cups as decorations instead or in addition to the cream. Can we all say YUM?! 🙂 Take a look at the recipe video below to see how it’s done. To celebrate Peanut Butter Lover’s Day, I’m teaming up with the Celebrating Food Holiday bloggers to bring you over two dozen spectacular peanut butter recipes. This peanut butter and caramel cheesecake is easy to make and tastes totally heavenly! Make sure to bring ingredients to room temperature before using and avoid over mixing the filling. Place a piece of aluminium foil on your counter top and place a kitchen towel square in the centre. Position your cheesecake tin over the kitchen towel and tightly wrap the foil around the base. Spray the tin with cake release and line the bottom and sides with greaseproof paper. Grind the Oreos to a powder using a food processor. Mix with the melted butter. Press the crust over the bottom of the prepared pan in an even layer and put in the freezer. Put the cream cheese and sugar in a bowl and briefly mix together with a hand mixer on low speed until it is smooth and creamy. Add the peanut butter and caramel and mix again until smooth. Add the sour cream and vanilla and mix once more. Add the eggs and mix until combined – do not over mix at this stage! Pour the filling over chilled crust and gently tap the pan on counter so that it settles. Cover the top of the pan with a piece of foil. Pour 350ml (1 1/2 cups) water into your pressure cooker and place the trivet in the bottom of the pot. If your trivet doesn’t have handles, create a foil ‘sling’ by folding a long piece of foil in half lengthwise and place your cheesecake over it to lower (and lift) out of the pot. Tuck the foil sling edges down the side of the pan. Set vent to ‘sealing’, choose ‘manual’ and set cooking time for 50 minutes at high pressure. Allow pressure to release naturally for 10 minutes and then manually release. Lift the pan out of the pressure cooker and carefully remove the foil. The cheesecake should have a bit of jiggle in the centre, but if it seems really jiggly then cover and return to the cooker for a further 5 minutes high pressure cooking (+ 10 mins NPR then manual release). Remove the foil from the bottom of the pan and place on a cooling rack for a couple or hours. Place in the fridge for 8 hours or overnight. To remove the cheesecake from the pan run a small knife around the edge to loosen the paper. Place the pan over a tin and gently push the tin downwards to release the middle. Peel the paper off the sides and gently remove the bottom of the cake pan. Transfer the cheesecake to a platter or cake stand. Make the ganache: place the chocolate and cream in a bowl and microwave for 30 second bursts, stirring after each, until completely melted and smooth. Spoon (or use a piping bag) the ganache over the perimeter of the cheesecake, encouraging it to drizzle down the sides. Spread the remaining chocolate over the cheesecake to cover. Whisk the cream, icing sugar and caramel together until it forms peaks. Transfer to a piping bag fitted with a large star tip and pipe over the cheesecake. Add chocolate sprinkles and a dusting of cocoa powder and serve. I used a 6L /Q Instant Pot in this recipe and a 7''/18cm push pan. Make sure that the ingredients are at room temperature and avoid over mixing the filling, especially once the eggs are added. You can use store-bought caramel (or salted caramel) or Dulce De Leche. If you want to make your own salted caramel follow this recipe here. The caramel needs to be totally cool before using so if you are making your own it would be best to make a day ahead and store in the fridge in a sealed jar (once it has cooled down). To remove cheese cake, you mentioned running a knife around paper to loosen…do you line sides & bottom with parchment paper? Sweet Heavens ! Thank you for the beauty ! OMG that looks insanely delicious! I have an Instant Pot but had never thought to make cheesecake. Brilliant! Your recipe calls for caramel. This is probably a dumb question, but did you use caramel sauce or something else. This looks really good. Thank you for your help. Hi Shirley – yes I used store-bought caramel. In the UK Bonne Maman do a version but you could also use Dulce de Leche. Salted caramel would also work really well – I will add a link to a homemade version also. These are some of the most gorgeous photos of cheesecake I have ever seen! Wish I could reach right into my screen and grab a slice. I really need to try cheesecake in my instant pot! Mind blown! I had no idea you could make something like a cheesecake in an instant pot. I fear when I get mine my oven may be abandoned! This recipe looks delicious! Gorgeous! This looks heavenly indeed! !